There's a lot about the original Traveller game to love (usually called Classic Traveller these days, and I will follow suit here; for the rest of this article, I will call it CT - and because it is the easiest to get now, being available in POD or electronic format from DriveThruRPG, I will use references from The Traveller Book). It's simple yet detailed, practical yet adventurous, short yet broad-ranging in scope. CT presented a default setting that was both science-fictional and familiar at once, walking a narrative line between "hard" SF and interstellar adventure. This article will cover two points: the misunderstanding that most people have about character improvement in CT and the basic structure of play in CT (which is dramatically different than that of more "story-oriented" gaming in recent years, but also somewhat different than RPGs of the D&D form of structure, which is most other RPGs). Here's a cut, since this ran long. Some people come to CT and see, or rather project, flaws in its rules. The most notable "problem" people see is the chance of a character to die before even beginning play. I have dealt with that previously, so I won't rehash that particular topic here. Instead, I'm going to address the supposed lack of any advancement system for characters. Despite there being a clearly-labeled section on the topic, there's a misperception that CT doesn't allow characters to become any better than they were at the end of character creation. The problem is actually that players have become so attached to the idea that characters advance due to their success (or fail to advance due to their lack of success) that they miss the simplicity of the CT system. The whole improvement system is laid out in a single page of The Traveller Book (on page 103). Basically, there are two methods of improving your character, with the first having two sub-methods and the other having three. The first method is to spend money and perhaps time, the second is to make a "dedication" roll to apply oneself to a program of self-improvement. Reading the rules strictly, the character must make a dedication roll for the methods that require spending money as well, but I would rule that it is one or the other, money or dedication. The two methods involving spending money are Education and Sabbatical. The rules are unclear on the matter, but I suggest that spending money for these takes the place of the dedication roll. Education costs Cr50 per session, with one or two sessions allowed per week, so long as Edu is less than Int. This can be to pay for correspondence courses, tutors, or the like. After fifty such sessions, the character's Edu score increases by one, with a maximum of six such increases in any given four-year period and to a maximum of Edu equal to Int. Alternately, the character may take a Sabbatical. This removes the character from the game for four years and costs Cr70,000. At the end of the four-year period, the character returns with any one non-weapon skill at a level of 2. This may only be done once in the character's life. There are three methods requiring only dedication: Weapon Expertise, Skill Improvement, and Physical Fitness. To make a dedication roll, the character must simply roll 8+ on 2D. If the dedication roll is failed, then the character must wait a single year before attempting to dedicate to a program again. Only Physical Fitness allows a modifier to that roll, which is basically a bonus for having a lower Int score (apparently, smart people in the CT universe have a harder time than less smart people of keeping to a schedule of repetitive activity). The player may only have the character engage in one of these programs at any given time. If the character engages in improving Weapon Expertise, the player chooses one gun (or, presumably, archaic missile weapon) skill and one blade skill. If the character had one or both of those skills at level 0, then the skill increases to 1 immediately and permanently. If the skill was 1 or higher, though, the skill increases by 1 point, but on a temporary basis. At the end of the four-year period, the temporary skills drop back down, but if a dedication roll can be made for another four-year period, the improvement becomes permanent. The example gives a character with a blade skill at 0 and a gun skill at 3. After making the first dedication roll, the skills increase immediately to 1 and 4 respectively. At the end of the four-year period, the player may attempt to make a new dedication roll. If this is failed, the blade skill stays at 1, but the gun skill drops back to 3. If, on the other hand, it succeeds, the blade skill rises to 2 (permanent skill of 1 plus 1 temporary point) while the gun skill becomes 4 permanently. At the end of that four-year period, the blade skill will drop back to 1 while the gun skill stays at 4 unless the character chooses to go for another four-year period of Weapon Expertise. For Skill Improvement, the process is much like Weapon Expertise, except that the player chooses any two skills that the character has at level 1 or higher, and initial improvements are always temporary but can be made permanent as normal. Note that the character is always limited (in The Traveller Book and some other CT versions) to a total number of skill levels equal to or less than the sum of Int and Edu. Physical Fitness is much like Weapon Expertise, except that the improvement is 1 point each in all three physical attributes (Str, Dex, and End), to a maximum of 15. Improvement is immediate but temporary, and the rules are unclear as to whether a second four-year period makes the improvement permanent. Strictly reading the rules, the improvement only ever lasts as long as the character is engaged in a Physical Fitness program. Now, look at that: all of the methods requiring only dedication rolls automatically improve two or three abilities by a point immediately. Those points may be lost at the end of four years of game time, but might not be. One of the methods requiring money may even be used prior to game play, as the character might muster out of service with KCr70 or more and just ask the Referee to allow it. That means that the character, after the skills in character creation, can pick up 2 levels of a single skill that the player wants, regardless of the availability of it through the chosen branch of service. Those players who really want to play pilots, for instance, can make use of this to gain significant piloting skill. None of these improvements (excepting perhaps the ones that charge money) are tied to the success of the character, which seems to be the real issue for a lot of people, but it's a misconception to say that the characters don't improve at all. While all of these periods of time look very long, keep in mind that a CT campaign is supposed to fast-forward through time pretty significantly. It's likely that a single session might cover a couple or even several weeks in the lives of the characters. If the players and Referee are practiced in the system, a single session could cover several months of game time, albeit most of it logistical and mercantile/accounting matters. EDIT (on 9/10/15) TO ADD: I also need to note that, despite the misunderstandings of some, none of these methods of character improvement (excepting Sabbatical) removes the character from play. All of them, with that one exception, is performed during character "down time", and so "off-camera" as it were. The character is still played normally while these improvements are going on. In the standard CT campaign, the characters will be pursuing ways of making money. Usually, this is through trade and commerce, which often does little more than pay for the ship the characters travel in, and frequently enough not even that. As a result, the players are on the lookout for Patron encounters, which can result in more adventurous activities and higher payouts compared to the time taken. Normally, Patron encounters occur once every three weeks on average (in port, as the weeks spent in Jump don't count for such encounters). The other sort of encounter that can result in payouts is the Rumor. Rumors occur around seven times in every twelve weeks, but most are not useful for getting paid. The third sort of adventure is the sort pre-designed by the Referee, but those are dependent on the specific Referee's campaign and not regular at all. I would suggest that most come about as a result of the Referee judiciously using regular Rumors and possibly Patrons in any case. Referee designed adventures typically consist of location-based adventures. In The Traveller Book, these are typified by, on the one hand, the adventure "Shadows", and on the other hand by the adventure "Exit Visa". The former is a more typical location-based adventure, consisting of a ruined structure on a planet that conceals a secret the players must solve. The latter is a more unusual location-based adventure, in which the "locations" are the many petty bureaucrats that make up the procedural maze that the players need to solve in order to move on. Outside of The Traveller Book there were similar purely location-based situations, such as Annic Nova, which involved the players exploring a derelict spaceship. Other adventure situations are possible, such as the Alien-inspired exploration adventure The Chamax Plague or its loosely Aliens-like sequel Horde. Many of those are just extended variations of the Patron encounter, however. The Chamax Plague, for instance, starts when the players are approached to help rescue some scientists stranded on a planet. Another type of location-based adventure that saw some use in CT was the "survival" adventure, in which the players were given some reason to pit their characters against the elements. 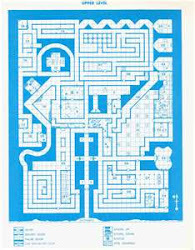 This sort was typified by Across the Bright Face, in which the characters are caught in the midst of a revolt and have to cross difficult terrain to escape to safety, Ascent to Anekthor, which is a Patron-based adventure in which the characters accompany a noble on a mountain climbing expedition, or Duneraiders, another Patron-based adventure in which the characters find themselves involved in paramilitary actions on a desert world. The worst CT adventures were mere railroads of sightseeing, such as Secret of the Ancients, and those became common just as they did in gaming generally at the time. So, the basic structure of play in CT is based around random encounters, but the specifics of those encounters were designed to be the seeds of adventure - the Patron especially, but also the Rumor. Other encounters, such as Legal, Random, and Animal, were intended to be either color or a tax on time spent, or both. In some cases, Random encounters were apparently intended as a possible adventure hook (fugitives, for instance), which would require a flexible and improvising Referee. In a typical CT session, the players would set their characters to doing the boring things that paid the bills - finding cargo, usually - but could find them embroiled in events involving bandits, fugitives, law enforcement (rightly or wrongly), or people looking for help (Patrons). They might also find Rumors that could lead them toward some sort of possible payout, like treasure maps in D&D. In any case, their intent to stay safe and paid could be overrun by events around them and the temptations of even greater paydays. This points to a specific sort of adventure design, not based around plots and stories, that was set aside. 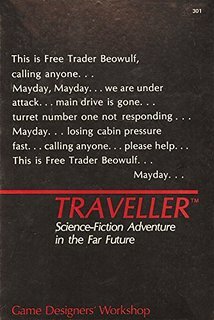 Sadly, my favorite edition of Traveller was overrun by adventures that were not well-suited to the game, ones that tried to impose a story on the players. What CT (and MegaTraveller) really needs are Patrons, locations, and adventures that are the object of Rumors. It also needs deep background, so that the players can get their characters involved in wider situations - but those sorts of extended adventures work best when they arise out of the adventuring group interacting in their own particular ways with that wider background. A really useful addition to the encounter types found in many issues of Journal of the Travellers' Aid Society was the "Casual Encounter". These were sort of like Patrons, as most Patrons were a single person encountered who had a mission, but different in that Casual Encounters did not usually have a single mission to offer. Instead, they were encounters that could be inserted into a session for any number of purposes by the Referee. Lothario Lochinvar Finger was an eccentric merchant, much like Cyrano Jones or Harcourt Fenton Mudd from the original Star Trek series, who could show up with any of a number of odd and mysterious technological artifacts and involve the players in adventurous situations. Mother Shom was a leader of organized crime who could be a friend or foe to the players, depending on their actions. And so on. This means, as a Referee, that there are several sorts of preparation that are most fruitful, once the basics of generating the backdrop of worlds using the rules in the books are finished plus Library Data (which is to say background information - this should probably be written in a way that makes it readily available to the players when their characters look things up, such as a wiki they can access through their tablets or whatever, or a book that can be put on the table): lists of Patron encounters of many types for use when a Patron encounter is rolled, possible locations for exploration in likely systems nearby (including unusual animals like Chamax, Arrakis Sandworms, Reticulan Parasites, or whatever), Casual Encounters (which are more or less ongoing Patrons), and further-off locations that can be associated with Rumors (plus various false Rumors, for when those show up). Rumors, of course, can also be tied to player goals, so listen to what the players are saying that they want their characters to do. Dammit all, now I want to get back to writing my own Traveller edition and wrapping it in a setting. Too many projects, too little time. 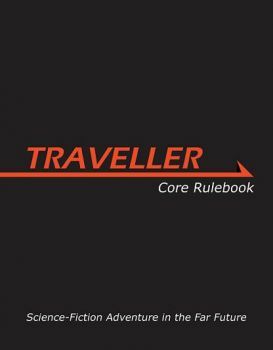 Traveller was my first RPG, both as a player and GM. However I don't think we ever used the experience rules (and in fact I had completely forgotten about them until flipping through the rules a couple of years so). As a result, I've never found experience systems particularly compelling. Instead, I define success through character goals and play. I think that is a perfectly fine approach, too. In such a case, the success of the character is measured in abstractions that matter to the player (or the player's conception of the character), or objectively in terms of money - which is not all that different than D&D's method of rating success! The character improvement system in classic Traveller supports that, too, since improvement isn't tied (at least directly) to success in the game. It's just something that the characters can gain over time, to reflect the simulated environment.